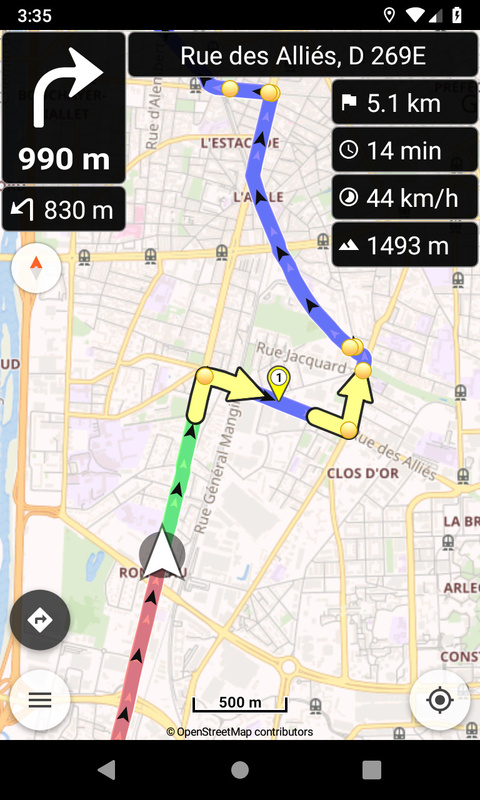 The app does a great job of following a route, and rejoining it after a deviation. Sometimes a route will intersect itself (e.g. https://kurv.gr/3RzMv), and the only way to know which route to follow, when the paths diverge again, is to look at the arrow and distance at the top of the screen. Sorry, I don’t have a screen capture. One way to make this clear on the map would be to un-focus the part of the route that is not current, either by blurring it or making it a lighter shade of blue. Another way would be to add arrows into and out of a convergence of the route for the current section. Thanks for the interesting ideas! Actually we have many plans for a more enhanced navigation. That looks fantastic. I’ll be happy to beta-test and critique it. Big LIKE for this upcoming feature! Note: this runs on a different project / engine, would need some implementation to integrate it here. That’s another project, don’t know how will be in Kurviger when time comes. But everyone please post your thoughts! Ich habe gestern beim Abfahren einer Route ebenfalls Richtungspfeile vermisst. 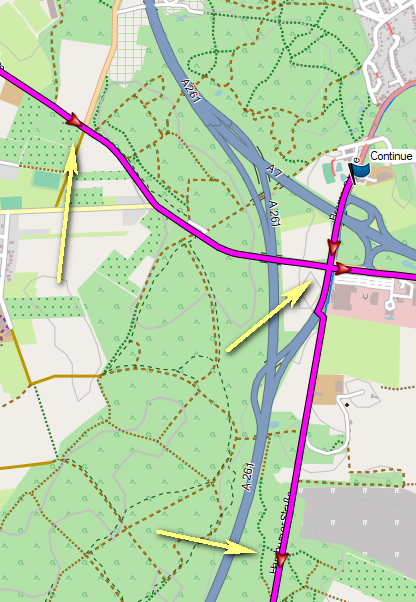 Vor allem, wenn man ohne Waypoints arbeitet, etwa bei einem Track, kann man sich fragen, wie die Route denn nun weiter verläuft, vor allem bei sich kreuzenden Routen. Allerdings sollten die Pfeile erheblich weniger sein, als auf dem Bild oben. So wie bei Basecamp reicht es vollkommen, siehe Bild. Yesterday, when I was driving a route, I also missed directional arrows. Above all, if you work without waypoints, such as on a track, you can ask yourself, how the route continues now, especially in intersecting routes. However, the arrows should be considerably less than in the picture above. As with Basecamp it is enough, see picture. I need to see some OpenGL issues, but should be doable.